This simulated voyage over the surface of Neptune's large moon Triton was produced using topographic maps derived from images acquired by NASA's Voyager spacecraft during its August 1989 flyby, 20 years ago this week. Triton was the last solid object visited by the Voyager 2 spacecraft on its epic 10-year tour of the outer solar system. Voyager mapped only the hemisphere that faces Neptune, but revealed a very young surface scarred by rising blobs of ice (diapirs), faults, and volcanic pits and lava flows composed of water and other ices. The video begins near the western edge of this hemisphere with an approach over cantaloupe terrain and two large smooth walled plains. The video tracks due east for roughly 1500 kilometers over a large province of volcanic pits, calderas and smooth plains. As can be seen in this video, Triton is locally very rugged (with pits and mounds that are typically a few hundred meters [several hundred feet] high), but has no large mountains or deep basins and regional relief is low. The lack of large topographic features is a consequence of Triton's high internal heat and the low strength of most ices. The video was produced by using a new topographic map of Triton, combined with a 1.65-kilometer resolution image mosaic. Topographic mapping was based on shape-from-shading analysis of the original Voyager images. Vertical relief has been exaggerated by a factor of 25 to aid interpretation. The raw data from which this product was developed were retrieved from the Planetary Data System's data archives. The Jet Propulsion Laboratory, a division of the California Institute of Technology in Pasadena, manages the mission for NASA's Science Mission Directorate, Washington, D.C. The Voyager spacecraft and its two onboard cameras were designed, developed and assembled at JPL. 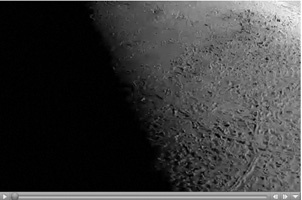 This video was processed by Paul Schenk (http://www.lpi.usra.edu/lpi/schenk/) at the Lunar and Planetary Institute.